Picosure is the NEW GOLD standard technology proved to remove tattoos faster and better compared to "Q-Switch" which is an older technology available in the market! Picosure- Cynosure is the faster tattoo removal in the industry clinically proven. Tattoo Removal Just Got Faster! if you have a tattoo that just isn’t you and you want it off, there is good news. Removing tattoos just got faster! With the recent surge in popularity of tattoos and the advancements in tattoo artistry, there are many reasons why a person with an existing tattoo may want it removed. An upcoming wedding? Employment opportunities? Perhaps simply to clear the canvas for better artwork? How Does Tattoo Removal Works? The ink used in tattoos is made from minerals. To understand how tattoo removal works think of the ink as tiny rocks. Picosure is the NEW GOLD standard technology proved to remove tattoos faster and better compared to "Q-Switch" which is an older technology available in the market! 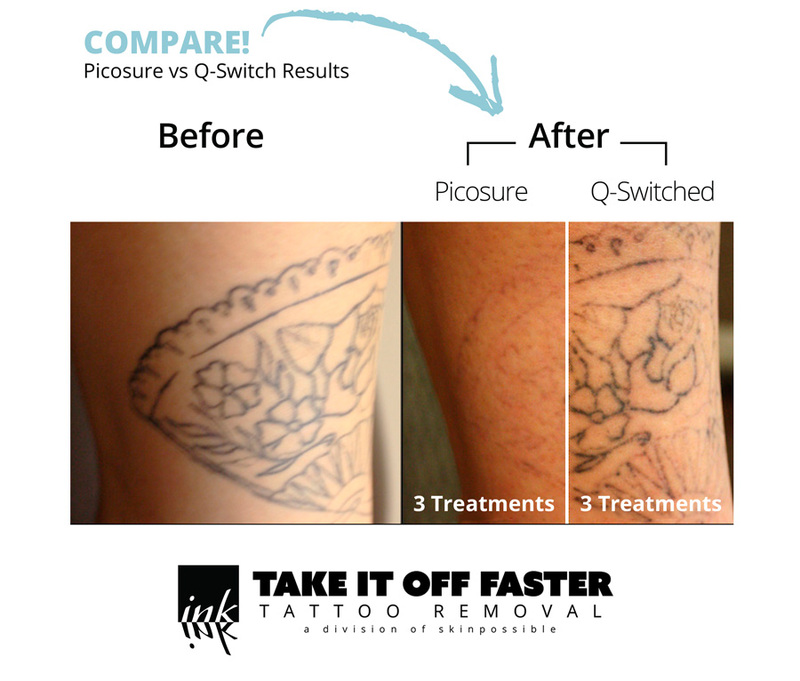 Traditional lasers used for tattoo removal are called Q-Switches. These nanosecond lasers predominantly rely on photothermal action and deliver heat into the pigment and surrounding tissue. With multiple treatments, the “rocks” are broken down into smaller and smaller “pebbles.” Many treatments are required to slowly clear the ink and total clearance is rarely possible. Picosure operates at speeds measured in trillionths of a second. It uses pressure-wave technology that creates an intense mechanical impact that shatters the ink into tiny particles. The “rocks” are not reduced to “pebbles,” but instead become “sand.” These tiny ink particles are easily eliminated from the body. Tattoos are cleared in fewer treatments, with less fluence, and without injuring the surrounding skin. The Picosure laser is effective on previously treated tattoos that failed to clear and even stubborn inks can be removed with fewer treatments. Tattoos can be cleared in one third the time as traditional lasers and with less discomfort. Healing time after a Picosure treatment is similar to that of traditional lasers but far fewer treatments are required. Dark colours such as black and dark blue will fade the fastest and may require only 1 to 3 treatments. Other colours fade more slowly and may require 5 (or more) treatments. Red and white will fade much slower than other colours. You will appreciate the cleaner look of your skin as the pigment diminishes gradually over a period of 6 weeks. Treatment may then be repeated. Picosure™ laser tattoo removal will cost less than traditional laser tattoo removal because fewer treatments will be required. The cost per treatment will be determined by assessing the size of your tattoo. At Skinpossible™ you only pay for the area covered by ink and there is no extra cost for coloured tattoos. You will pay as little as $125 per treatment! Yes, you can count on receiving quality treatments and a high standard of care for a reasonable price every day at Skinpossible. Assessments are free, so call today! Picosure leaves traditional lasers in the "Dust!" Picosure is a breakthrough in tattoo removal. This groundbreaking technology was FDA approved in the U.S. in December 2012 and was approved in Canada in July 2013. As at the date of this writing, there are 17 Picosure lasers in the U.S. The first Picosure in Canada located at Skinpossible Laser & Light Solutions in Calgary, Alberta. Laser technology has made it possible to remove unwanted tattoos via a faster and safer method than ever before. No longer will you need to consider skin-damaging treatments such as acid removal, excision, and dermabrasion. Today’s aesthetic lasers offer a proven alternative for safer and more effective ink removal. Lasers remove the ink by targeting ink’s pigment with a high-intensity light beam causing it to break up into smaller molecules. The ink is then absorbed by the natural bodily processes, fading the tattoo until it is no longer visible. While the cost is about the same, older technologies require 10-15 treatments and only provide 70% elimination of your tattoo. There are only 18 PicoSure Lasers in the World and we are glad to have one! Cosmetic Laser Tattoo Removal available in Calgary! Tattoo and Microblading eyebrow removal are possible! Because sometimes bad brows happen to good people. When women get microblading for their eyebrows sometimes their brows don’t turn out the way they wanted. 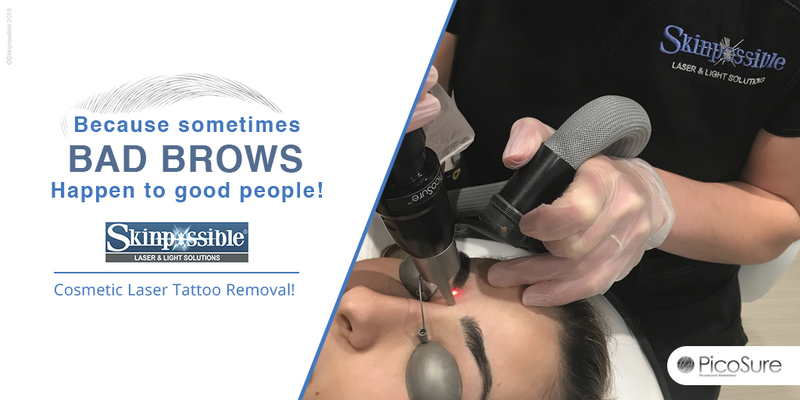 If that happened to you or someone you know, we can help, we can remove both tattooed and microbladed eyebrows with Picosure or laser tattoo removal. The multiple treatments required by Q-Switch lasers, especially when the R20 method is used, can cause scar tissue to form. The ink can then become impacted in the scar tissue and become recalcitrant, which means it no longer responds to further treatment. Picosure's unique ability to break down scar tissue allows it to clear the ink that failed to clear from other lasers. It may take more treatments to clear but, yes, Picosure can clear it. Unfortunately, not everybody is a candidate for tattoo removal. Tattoo removal is looking for pigment so people that have a lot of natural pigment I their skin cannot undergo the treatment. Fair to medium skintypes can safely undergo treatment but tattoo removal is not suitable for very dark skintypes due to a high risk of hyper and/or hypo-pigmentation. There is an amount of discomfort involved in this procedure. We manage it with the application of medical-grade numbing cream beforehand. This topical anaesthetic combine with the application of cooling air during the treatment make the treatment quite tolerable and most people can get through even large treatment areas quite easily. The chances of scarring are virtually zero if you are compliant with the aftercare instructions given to you by your treating clinician. Picosure was originally developed for the purpose of scar revision. The Picosure is now also FDA approved to treat acne scars, which further demonstrates its positive effects on scars. Anecdotally we have seen an improvement in scarring in tattoos, and have seen raised tattoos flatten. Even though Picosure may flatten out raised scarring, there may be pre-existing hypo-pigmentation (whitening of the skin) underneath the ink. Once the ink is removed, the hypo-pigmentation might become evident. This pigmentation was caused by an improperly done tattoo, and it will remain after the ink is removed. For the most part, people can resume most activities right after treatment. Some restrictions may be necessary to ensure proper healing. This will vary slightly depending on the size and site of the tattoo. Most people do not experience any blistering but it is possible, and not uncommon, to develop blisters. In the event you do blister you will need to care for your blister like you would any burn to prevent infection. Instructions for how to do so are included in the written instructions we will give you. Yes, we can fade a tattoo without complete clearence, it is exactly the same procedure! You simply cease further treatments once you have achieved the desired level of fading. Yes, you can purchase just one treatment at a time for laser tattoo removal. You will, however, save money when you buy a series of three treatments. 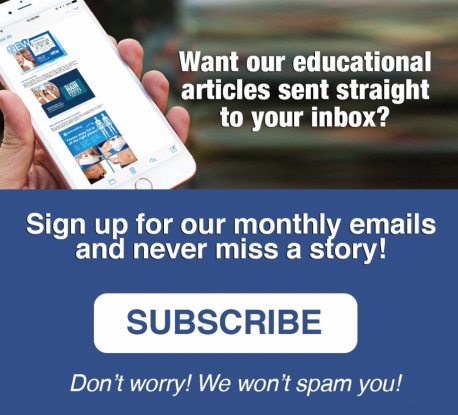 We encourage a series for two reasons:• It will save you money. Not only will you enjoy significant savings on the first three treatments,if you require further treatment(s) you will get the same discount on those as well.• People who make their tattoo removal treatments a priority by buying a series will ensure that they are getting their treatments on time. They are more likely to remove their tattoo in a timely manner without the concerns of month-to-month budgetary challenges. Yes! Picosure can remove blue and green ink. Unlike Q-Switched technology, Picosure has absolutely no problem removing blue and green ink. It can even get the remaining blue and green left over from a tattoo treated with Q-switched treatments that is now scarred or blurred. Yes, we can certainly remove part of a tattoo, and with a lot of precision. Depending on the level of detail, a touch up at your tattoo shop may be required after your series of treatments. You will likely see fading of your tattoo after the first treatment, although that is not always the case. Scarring from the tattoo artist or from previous laser treatments, the type of ink, and many other factors determine the progress of the fading. Everyone responds at a different rate. Some people see a difference with every treatment, while others will not see much change for a few treatments in a row. In any case you will definitely see clearance happen faster than you would have with a Q-switched technology. Conventional Q-switched technologies use the Kirby-Desai Scale to determine the number of treatments, That scale does not apply to the Picosure as it does not interact with the skin or the colours of the tattoo in the same way. 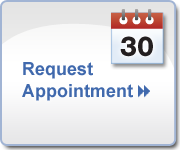 During your consultation, after seeing your tattoo, we will be better able to suggest the number of treatments it will likely take. Picosure has been clinically proven to take tattoos of in half the amount of treatments, and often even faster. In most cases a minimum of three to five treatments will be required, although we have even seen tattoos come off in a single treatment! This is not common but we have seen it several times! No, faster removal does not mean treatments are closer together; it means fewer treatments overall. We always recommend waiting at least six to eight weeks between treatments to give you the best result. Even though your skin will be healed far sooner, your lymphatic system will need time to clear the ink from the treatment site. If we treat too soon after, the laser will be targeting the same ink as the last treatment, because it would not have had time to clear from the site. Treating prematurely will not necessarily clear the ink faster. Removing tattoos with Picosure is faster because you need fewer treatments to fade or remove the ink. Because, thanks to our Picosure laser, we can do just that... take the ink off faster! There are many different tattoo removal technologies on the market. In addition to Picosure, Cynosure has Accolade, Medlite C6, and RevLite. Fotona Lasers has QX-Max. More obscure companies like Quanta Lasers have a series of technologies. Some laser tattoo removal places have lasers from unknown Asian companies who offer cheap technology that has noFDA or Health Canada approval to speak of. All of the above mentioned lasers are Q-Switched lasers and, therefore, do not fire their laser at Picosecond speed. This is what distinguishes Picosure from all other lasers, and why it has been clinically proven to remove tattoos in half or even one-third the number of treatments as a Q-switched laser. The Picosure laser fires in picoseconds. It's hard to fathom, but that is one trillionth, or one millionth of one millionth of a second! These pulses create a photomechanical effect, or PressureWave™, that targets ink while avoiding unmarked tissue. PressureWave™ shatters the ink and brown spots into tiny, dust-like particles which are easily eliminated by the body. The result is clearer skin, in fewer treatments, without injuring the surrounding skin.The laser fragments the ink, allowing your body to absorb it and break it down naturally.